Another year has flown by and for most people September has just come to pass too quickly. Time flies when you’re having fun … or just busy. 2018 has been a year of great activity and by August we had reached a technical recession. A recession is 2 consecutive quarters of negative GDP growth and our most recent dance with this emotionally taxing indicator was in 2008. 10 years apart is a concern and understanding this recession will provide an indicator for Q3 and Q4 performance. 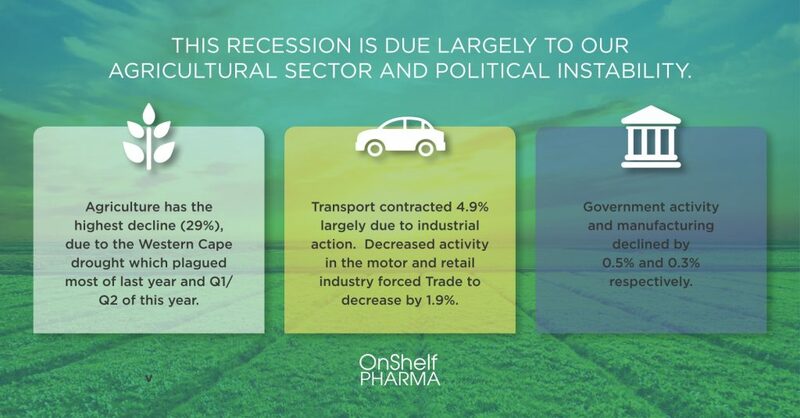 Agriculture has the highest decline (29%), due to the Western Cape drought which plagued most of last year and Q1/Q2 of this year. The heavy storm in Mpumalanga damaged fields of crops. Climate-soil conditions leave only 12% of the country land that is suitable for rain-fed crops hence 2 climate volatile regions will impact our capacity for Agricultural output. Transport contracted 4.9% largely due to industrial action. Decreased activity in the motor and retail industry forced Trade to decrease by 1.9%. Government activity and manufacturing declined by 0.5% and 0.3% respectively. Therefore, this recession is due largely to our agricultural sector and political instability. Analysts anticipate a slightly higher GDP growth of 0.9% for Q3, 2018 in South Africa and global growth remains encouraging. 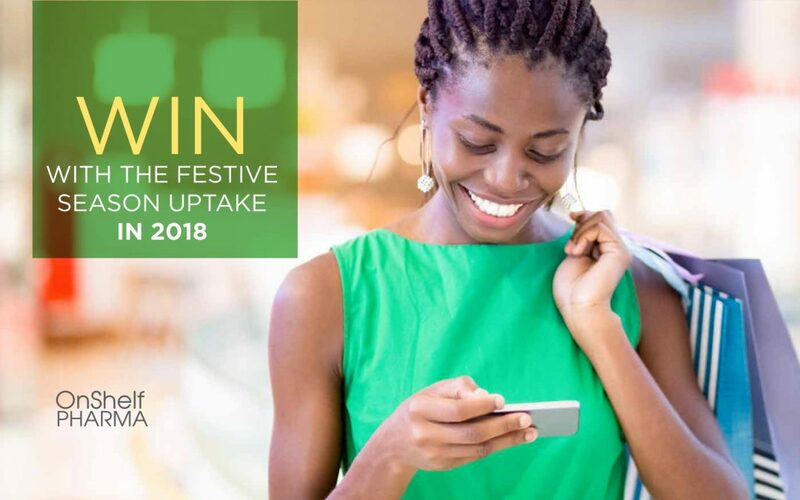 Q4 has the potential of Christmas sales uptake and this usually see’s growth as South Africans spend on season drivers, like Christmas decorations, gifts, social events …etc. In 2017, retail sales alone had a 5.3% increase for December and January. Customers out there are shopping, and retailers need to remind people to shop with them. Advertising buys share of minds with consumers and presenting the most compelling offer in your businesses sector, creates a competitive advantage. Having a sale or special value offer is a must as consumers will be careful with their choices. Depending on your size of business and target, advertising could be the more traditional broad reach media options with TV and Radio or it could be digital. A compelling campaign that starts the conversation with advertising and ends in store will likely lead to higher conversion. Friday was valued at R 1 million. Cyber Monday is also popular but to a lessor extent, with 129 000 transactions. The highest volume hour of transactions for both shopper days is between 4pm-5pm, indicating that people are rushing in after work with product and price being the primary driver. Create the best all-inclusive campaigns that closely identify with your primary target market or the themed event. Think out of the box and aim to differentiate with components such as packaging, price, value, delivery, online experience, pre-sales and after-sales service. Convenience sits high on the purchase decision tree for online shoppers and with great affordable services from The Courier Guy, The Post Office etc… brands are using delivery to differentiate. Price will be a strong factor because people simply have less to spend in their households. Vat, fuel, municipal cost increases, in the absence of wage increases and job opportunities for growth, have grown the financial obligations of households relatively quickly. So, where we previously would have ranked price low on the decision to purchase, it now plays a bigger role. The Internet continues to grow and should be a tool in the toolbox of every retail strategy. E-commerce accounts for approx. 1% of the entire retail spend in South Africa. Looking at the US, where online accounts for 10% of retail sales, shows South Africa still has a long road of potential. According to a report by PayPal, 58% of internet users shop online. As the market finds more solutions to barriers to internet shopping, like data costs, credibility, logistics… Internet shopping with grow exponentially. Therefore, it is wise for brands and businesses to develop their internet footprint and due to the pace of change with digital, the internet proposition should be evaluated at every strategy evaluation. Have more direct conversions with your shoppers. As millennials and younger mature into the economy, they are making up a growing constituent of shoppers. 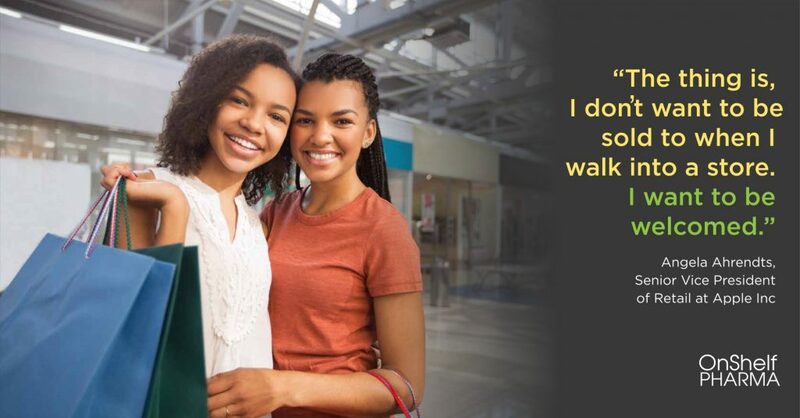 A recent study by Accenture showed that not only are millennials drivers to purchase different, they’re also influencing their parents shopping decisions. Millennials are frugal and invented the sharing economy, often doing house shares or car pool. They’re also socially and environmentally conscious, creating some difficulty for brands as solutions to these concerns have not fully realised. e.g.) Plastic waste awareness has caused neck swinging changes in purchase decisions as people try to do the right thing, however technology has not evolved to create bio-degradable packaging within the required pricing parameters. Finding ways communicate your businesses position on things that are important to your shoppers is critically important. Achieving this starts with understanding your target market. 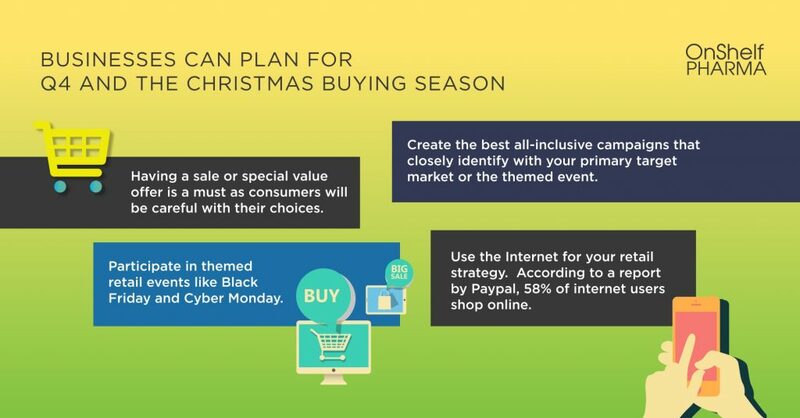 The festive season brings growth potential and as indicated by sales off take on Black Friday and Cyber Monday, people will extend into debt and shop impulsively for a good deal. Be cognisant of shoppers affordability on a unit price level and bold with their basket spend by offering value deals. The exciting part about retail is that it’s constantly changing and brands and businesses need to focus on adaptation to not only survive, but thrive. Winning strategies always start with the reason for being and as the internet generation increases buying power, it’s important to market effectively to these shoppers. Angela Ahrendts, Senior Vice President of Retail at Apple Inc.has been quoted as saying “The thing is, I don’t want to be sold to when I walk into a store. I want to be welcomed.” This neatly sums up the changing customer and her expectations. Launched by Prana | Copyright © 2018 OnShelf Pharma. All rights reserved.